Welcome, friends, I hope you’ve had a lovely April. Montana is still struggling to fully commit to spring but right now it’s delightfully sunny and almost 60, which makes for a smiley Lindsey instead of the frowny Lindsey of last weekend’s flurries. 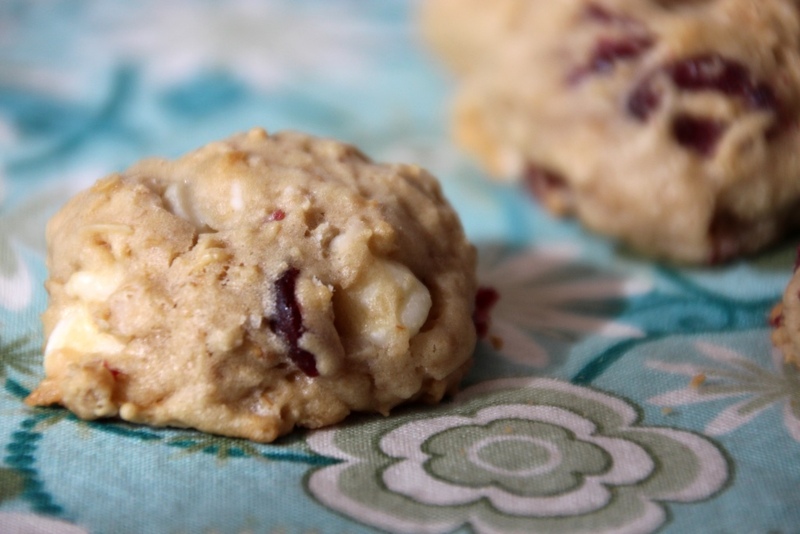 I love these cookies for their light texture and cranberry white chocolate combo, but also because they feel just a bit healthier than the usual peanut butter and chocolate combos you find ’round these parts. Obviously they’re still cookies, but I feel slightly less guilty having a few of these. (Psyche! I never feel guilty eating cookies.) And cranberries are fruit, and fruit is healthy, so basically these are healthy, right? 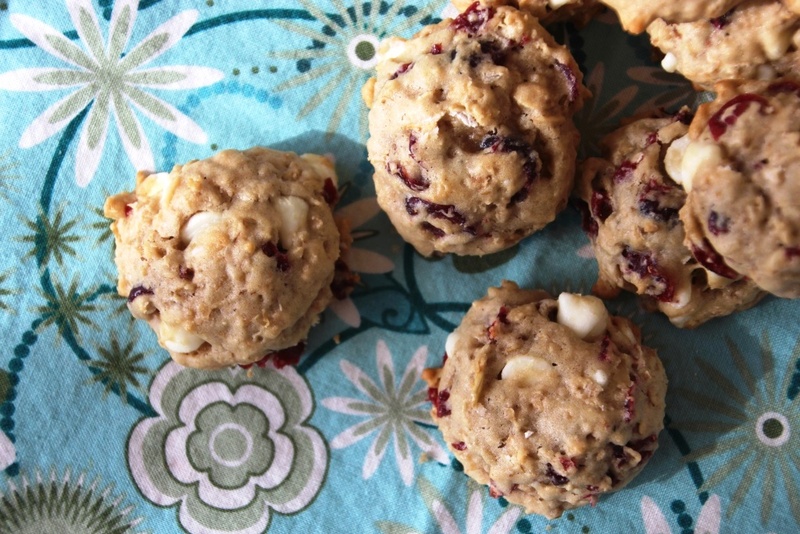 My favorite part about these cookies is that even though they taste summery to me, they have no seasonal ingredients, which means you can make them all year round. Especially in late January after the Christmas fun has worn off and spring isn’t quite on the horizon. They are also super easy and take minimal measuring cups, which are always extra points in my book. For this recipe I like to use my small 1 Tbsp cookie scoop that results in bite-sized delights. If you prefer a large cookie, you’ll need to bake them an extra minute or two, so bake a test cookie to figure out the timing. Preheat oven to 375 degrees Fahrenheit and line two cookie sheets with silicon mats. Beat butter and sugar on medium speed until fluffy. Whisk together oats, flour, baking soda, and salt in a separate bowl. Beat in flour mixture in three or four additions, mixing well between each addition. 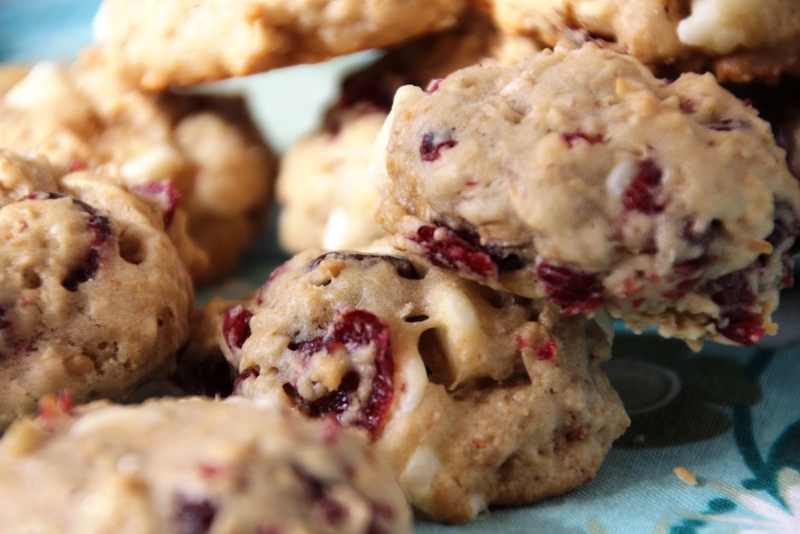 Gently stir in Craisins and white chocolate chips until well distributed. Using a 1 Tbsp cookie scoop, drop onto cookie sheets and bake for 8-10 minutes, (I usually do 9) or until lightly browned. Let cool on cookie sheet for a couple minutes before transferring to a wire rack to cool completely. Store in an airtight container on the counter for several days, or in the freezer for several weeks.